Rational Whimsy | Long-Term Investing: How Much Growth is There, Really? Long-Term Investing: How Much Growth is There, Really? I’ve been really interested in money lately. Namely, how to keep it from flowing forth from my pockets, and even how to make it grow on its own. This, along with discussions of money amongst other grad students in my department, led me to create a PowerPoint presentation (available after next month) giving a basic overview of things like budgeting, debt, and investing. Now, when talking about investing with those that have invested, I’ve tended to have the feeling of it being this mystical world where money goes in and dice are rolled. If they land face-up on your number, then you’re lucky and you get something back. Otherwise, your funds are in the abyss. I didn’t quite see how it all translated to growth over time. However, I was vaguely aware that some math was involved, and I happen to do math every single day. So, I wrote a quick Python script to calculate how money can grow over time. It resulted in the plot you see below. With $0 principal investment and a contribution of $100 per month over 40 years, you can do fairly well (depending on your rate of growth). Even though over those 40 years you only contribute $48K, your money more than doubles! That’s insane! Now, it’s not good enough to just hard code in some values and produce a plot. At least, not if you want people to want to use what you create. So, with that in mind, and wanting some practice using the iPython Notebook, I wrote an adjustable script so that you can see how your investment can grow with any (consistent) monthly contribution, any principal contribution, any interest rate, and any length of time. And anyone (that’s familiar with Python) can use it! Unfortunately, I don’t know Java (yet), so this is what you get. Still, it’s something. If you want to actually use the Jupyter Notebook I wrote, get your own copy from here. Comments are always welcome. Cheers! 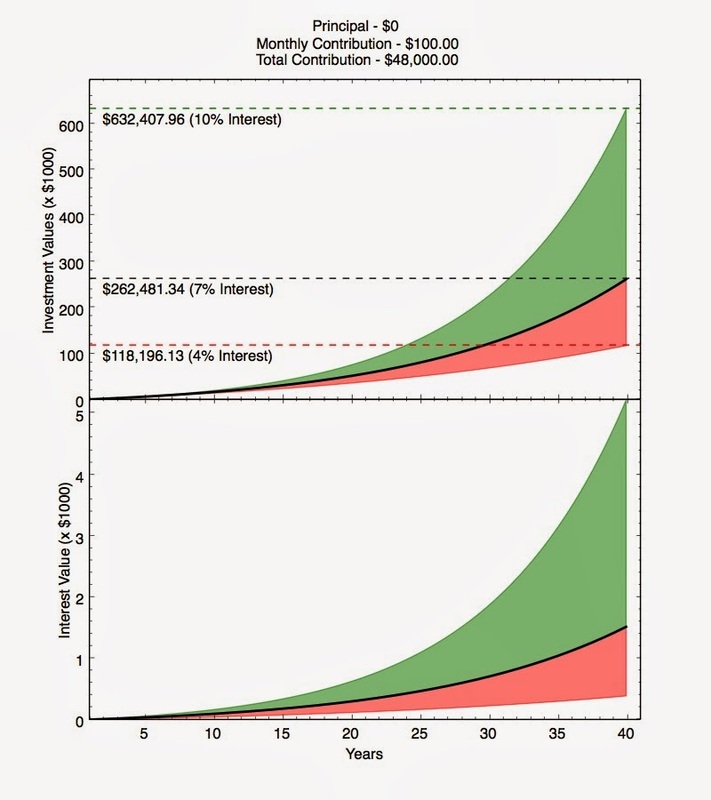 Note: I use the compound interest formula, and the default is a monthly compounding.